The Olympus TG-5 is the perfect camera for any underwater photographer looking for a small, almost unbreakable device that can shoot stunning photos at low cost. In other words, it exudes compact practicality. The TG-5 is famous for its amazing macro capability (in microscope mode) without the need of a macro lens. It is also capable of producing stunning wide angle images, especially when paired with a wide angle wet lens. The Olympus Tough TG-5 is an award-winning camera known for its versatility, ruggedness, fantastic macro capabilities and high performance-to-cost ratio. Beginners will love the combination of simplicity, functionality and image quality this camera provides. Intermediate users will love the semi-manual aperture priority shooting mode, the wide angle capability with a wet lens, and the camera's native microscope (macro) mode. 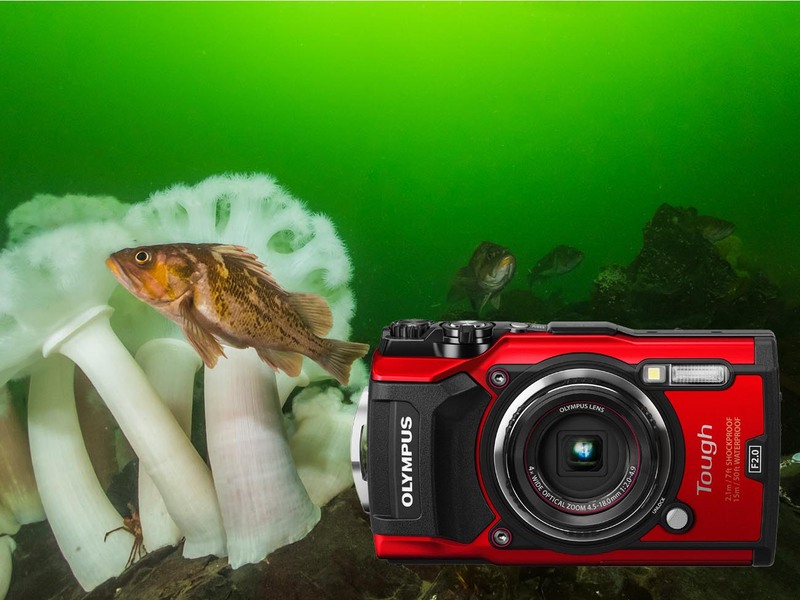 Advanced users with large and expensive underwater rigs may find this camera is the perfect companion to complement their large and bulky setup, both underwater and topside. As the latest camera from a brand that actively considers underwater shooters when designing its products, this camera is packed full of features useful to underwater photo and video shooters. Not only is the camera waterproof down to 50ft (15m), but it is designed with the Olympus PT-058 UW housing rated to 147ft (45m). This housing is the most affordable TG-5 housing on the market and accepts most popular underwater photo accessories. The Olympus TG-5 also packs RAW files, 4K video recording, 1080p video recording at 120fps (4x slow motion! ), a super macro mode with minimum focus distance of 1cm, and automatic TTL flash control with Olympus and/or 3rd party underwater strobes. The Bottom Line: Choose the Olympus Tough TG-5 if you need an affordable, small, easy-to-use, rugged compact camera that is capable of taking stunning photos. The macro capability of this camera is unparalleled for the price and stunning super wide angle images are possible with the addition of a wet wide angle lens. One of the greatest attributes of the Olympus Tough TG-5 is in its name - it's a tough camera. It is waterproof to 50 feet (without a housing), dustproof, crushproof to 220lb, shockproof from 7 feet, and freezproof to 14 F. Beyond diving, it's the perfect camera for going on adventures from a relaxing vacation in the tropics to extreme sports extreme environments. 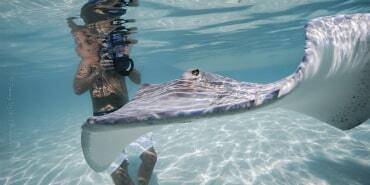 It's an excellent, easy-to-use camera for snorkeling as you don't need a housing at shallow depths. This attribute makes it a safer camera because if the housing floods at depth, it will have a much higher chance of surviving the flood. Microscope Mode is a camera setting which allows you to get really close to very small subjects. In normal shooting mode, you cannot focus on a subject that is closer than 10 cm from the camera. However, in Microscope Mode, you can focus on a subject as close as 1 cm! Using the camera's optical zoom in Microscope Mode allows you to take a photo with up to 7x magnification (35 mm equivalent), which results in amazing macro photos of very small subjects. For comparison, the standard for micro-four-thirds macro shooting, the Olympus 60mm f/2.8 macro lens (used with a mirrorless camera like the OM-D E-M1 or E-M5), has a maximum 2.0x magnification (35 mm equivalent). So the 7x magnification of the TG-5 is absolutely phenomenal. Additional use of the digital zoom allows overall magnification of up to 28x, although at a significant cost to image quality. With the Focus Stacking function, available in microscope mode, the camera shoots a number of images, automatically shifting the focus in each image. It then combines these photos into a composite image with a large depth of field, so that the image is in focus all the way through. Focus stacking is a nice function for using on land, when you can keep your camera and subject totally still. Underwater, there are likely very few situations where it would be particularly usable, if at all. None of the great macro photos shared in this review by UWPG members were taken using focus stacking. With Focus Bracketing, the camera will automatically shoot a series of images, with each image having a shifted focus point. You can set up to 30 shots for bracketing use. This function could be more applicable underwater, especially for photographers using video lights for their lighting, rather than strobes. The Olympus TG-5 uses the same size 1/2.3" BSI CMOS sensor as the TG-4, although the TG-5 pixel count was reduced down to 12MP, from the TG-4’s pixel count of 16MP. Smaller pixels allow a sensor to capture more detail in a photo, which is why a higher megapixel count is often thought to correlate with higher image quality. So why did Olympus reduce the megapixels? This is for two main reasons. Firstly, less megapixels in the same sized sensor means each individual pixel is larger. Larger pixels create less signal noise than smaller pixels. This means that the larger pixels of the TG-5 result in better low light sensitivity; TG-5 images have less noise in the dark areas and shadows than TG-4 images. This improvement is amplified by the upgraded TruePic VIII image processor (the same as in the OM-D E-M1 Mark II, though without the E-M1 Mark II's dual quad core), which also does a better job at reducing noise than its predecessor. 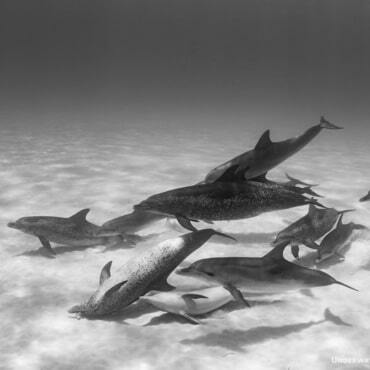 This effect is most noticeable when shooting at ISO levels above base ISO, which is especially relevant for shooting ambient light wide angle photography, and underwater video. Secondly, less megapixels means less data, which leads to faster image processing - essential when recording 4K video and high-fps bursts. The TG-5 does have an upgraded image processor, but the lower megapixel count probably makes a bigger difference in processing speeds. Larger pixels can also have higher dynamic range than smaller pixels. Higher dynamic range allows for better capture of high-contrast scenes (think: underwater reef scene with a sunball). You can get optical TTL when using fiber optic cables with the Sea & Sea YS-03 (also see TG-5 package with YS-03), YS-01, YS-D1, and YS-D2 strobes. You can also use the Inon Z240, Z330, S2000, or D2000 strobes. TTL works in all modes - P, A and auto modes. One notable downside of the TG-5 when using with strobes, is that on max power the internal flash recycle time is about 4 seconds (meaning you will have to wait that long in between taking photos with the strobe). Often the flash should not be firing at max power though, meaning typically less time between shots. There is also an option to turn down the power of the internal flash using the flash compensation function, which will reduce the flash recycle time further, meaning even less down-time between shots. The video options of the TG-5 got a serious upgrade from the TG-4. For top quality video, the TG-5 offers ultra HD 4K video (3840x2160) recording at 30 fps (approx. 102 Mbps bit rate) or 25 fps. Note that when shooting in Microscope Mode, resolution is limited to 1080p at 60fps. For making neat timelapse videos, the quality options are 4K 3840x2160 or 1280x720. The TG-5 also offers high speed movie mode, allowing you to shoot 1920x1080@120fps (equivalent to 4x slow motion). At lower resolutions you can shoot higher fps rates: 1280x720@240 fps, and 640x360@480fps. Photo of a sunflower star highlighting the Olympus TG-5's wide angle capability. Olympus TG-5, Fantasea UWL-400F wide angle wet lens, dual Sea & Sea YS-D1 strobes. 1/30, f/8, ISO-200. When compared to other popular compact rigs like the Canon G7X Mark II or Sony RX100 V/RX100 VI, the TG-5 falls short on many of the specs, including sensor size and image quality. However, it has clear advantages in cost, as the TG-5 camera/housing bundle it is significantly cheaper than G7X Mark II bundles and less than half the cost of RX100V bundles. It also stands out for its simplicity and macro shooting, with the outstanding microscope mode allowing great macro shooting without wet macro lenses. This further helps to keep things simple and low cost. The TG-5's amazing performance can be stretched even further with macro and wide angle wet lenses. 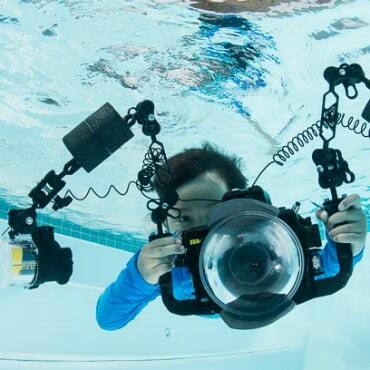 These lenses can be changed out underwater, giving you the ability to shoot both wide angle and macro in the same dive! Macro wet lenses allow you to get even closer and more detailed photos than the already capable microscope mode of the Olympus TG-5. A strong diopter such as the Nauticam Super Macro Converter or the Kraken KRL-03 +12 can be a great way to open up the realm of super macro photography to new boundaries. Going for something with a little less magnification such as the Bluewater +7 is an easier option for beginner macro photographers. Without a wide angle wet lens, compact cameras such as the Olympus TG-5 tend to struggle in the area of wide angle underwater photography. A wide angle wet lens allows the photographer to take photos with a wider field of view and get closer for more color and detail in the image. See the examples below of wide angle photos taken with a wide angle wet lens and without. Kraken Sports KRL-02 - The Kraken KRL-02 Wet Wide Angle Lens offers an ultra wide field of view of 150º at an affordable price. It is designed to be used with cameras with 24mm focal length, such as the Olympus TG-5, without vignetting. This lens is smaller than other wet wide lenses, which makes it a perfect pair for smaller compact camera housings when traveling. 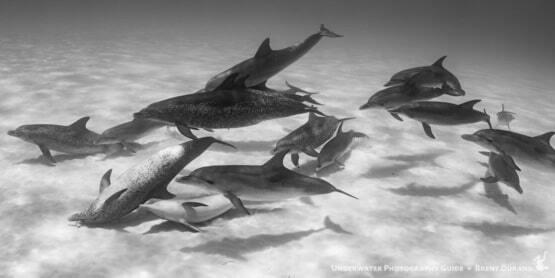 There are five great underwater housing options to choose from for the Olympus TG-5. 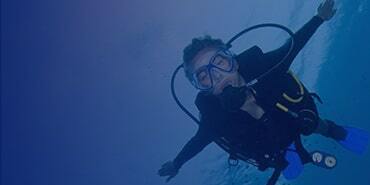 It is important to note that the Olympus TG-5 does not fit the older TG-3 and TG-4 underwater housings. 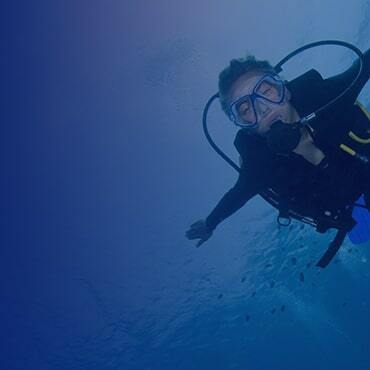 Choose Olympus, Recsea CW, or Ikelite if your focus is on the dive and photos are just for fun. In addition either of these options are great for those on a budget. If you really like to tinker with your photos or settings, a higher end aluminum housing, such as Nauticam or Recsea Aluminum is recommended. All housings feature fiber optic ports for attaching strobes, and the ability to add a tray with handles for a more professional feel. Unfortunately or fortunately, the Olympus TG-5 cannot shoot full manual. Therefore, we recommend shooting in Aperture priority mode. For beginning photographers this can make taking photos a breeze. For experienced photographers this still offers control of the depth-of-field, but it can feel limited as compared to shooting in manual. If using a strobe, auto white balance delivers accurate color balance - just remember to set the internal flash to forced flash mode and your strobe to TTL (or manual if you're comfortable with more adjustments). Remember that shooting at an aperture of f/14 will allow for much of the subject to be in focus. You can also experiment with opening the aperture for a shallow depth of field. Zoom the camera all the way out and get closer to your subject for best lighting. This also helps to get as much of scene in the frame as possible. Shooting with a wet wide lens* allows you to get a wider field of view while being very close to your subject and is recommended for the best wide angle shots. For shooting wide-angle into the sun (as you would for a sunburst or silhouette), stop down the aperture to f/14. This will decrease the light entering the camera and help freeze the water to capture stunning sun rays. *Some wet wide lenses may vignette on the TG-5 (dark corners), if this is the case zoom in as little as possible until the vignetting is gone. The Olympus TG-5 is a great compact camera for underwater shooters who want a simple system on a budget. The camera is the perfect topside adventure companion, making it a smart purchase for the dive boat even if you already have a big camera system. It's even a nice companion to have underwater alongside your big camera rig, as you never know when you'll be shooting wide angle on your main rig and come across an awesome macro subject like a seahorse or nudibranch. The TG-5's upgrades in low light performance deliver better image quality, with less noise than the popular TG-4 when shooting underwater video and ambient light wide-angle, both of which often require shooting with ISOs above the base 100. This camera is the top choice for anyone looking to get into underwater photography and take some great photos, without spending a huge amount of money or having a large, complex rig to carry around. The combination of specs, features, add-on options and ruggedness, for the low price of camera and housing, make the TG-5 stand out from its competition. Review of the Olympus TG-5 with recommended lenses, housings and settings.